Fill out all fields to the best of your ability. If you don’t have a fabric chosen, type your desired fabric, such as “red velour” and we’ll return with some suggestions. Use the “Special Instructions” section to specify any additional requests, directives or details. If it is more convenient, download a paper copy, and send to us via fax or email. Please Note We figure you probably need more than one set of QTY, style and length fields- use this section if necessary. If this form does not have enough fields you may choose to use our paper copy, call us, email us, go crazy on that special instructions box, or fill it out multiple times. Refer to directions Full directions can be found at the bottom of this form page, or on the downloadable PDF. 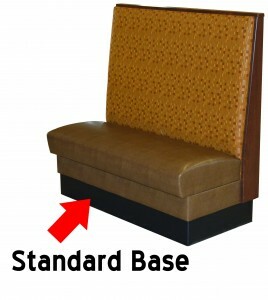 STANDARD BASE: The standard base features two tiers. 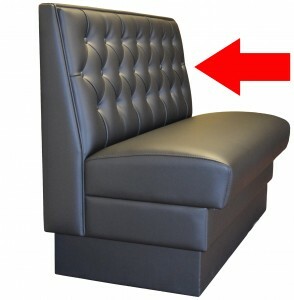 The seat fabric is the standard vinyl for the upper tier with an option of rubber, vinyl, or plastic laminate for the kick base. 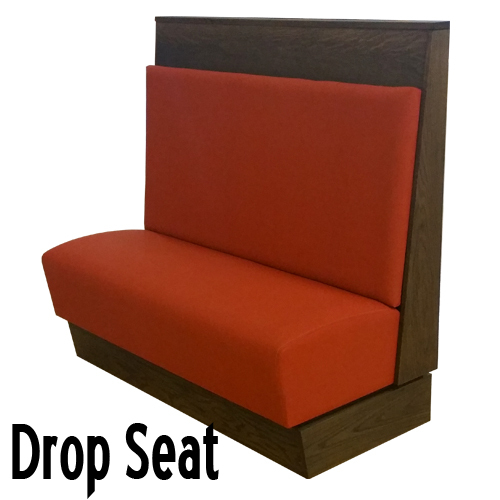 DROP SEAT BASE: A drop seat eliminates the top tier and opens up customization options for the single base. 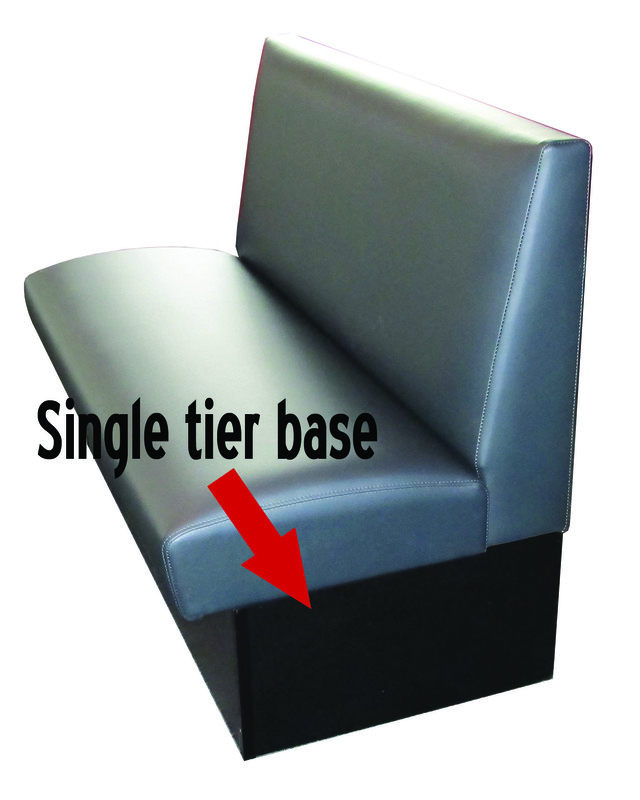 SINGLE TIER BASE: A single tier base is ideal for concrete curb applications. 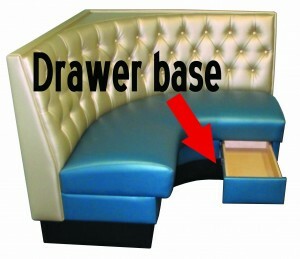 DRAWER BASE: Concealed from patrons, takes advantage of otherwise wasted space for dining room extras. 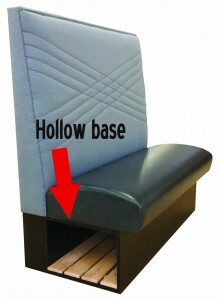 HOLLOW BASE: Room in the base to stash luggage or shopping bags. 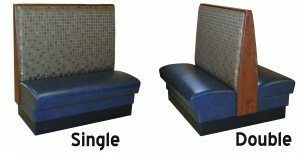 All corner, L or U Shaped booths are built in L shaped sections. Provide the dimensions for both wings of the section. Radius corner is standard; indicate in special instructions if the corner is squared. 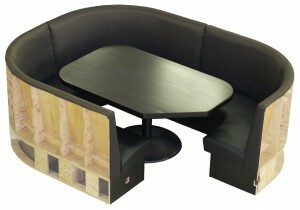 BOOTH TYPE: S -Single, D -Double STYLE: Classic, Headroll, Fanback (or arched top). 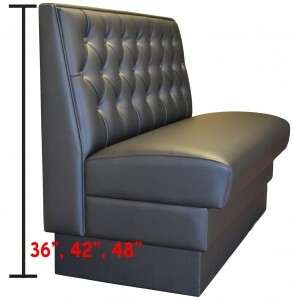 LENGTH: Standard size is 48”; all other lengths, please measure to the nearest quarter inch. 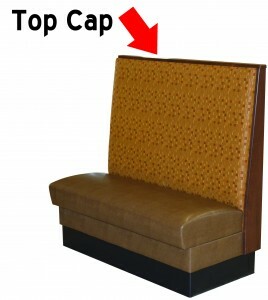 HEIGHT: Standard height is typically 36”, 42”, or 48” measured from the floor to the top of the booth back. 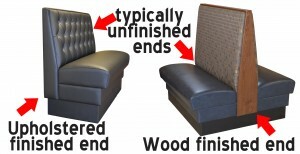 INSIDE BACK: Refers to the finish on the insides seat back; SM-Smooth, TF-Tufted, DF-Diamond Tufted, CH Channel back. 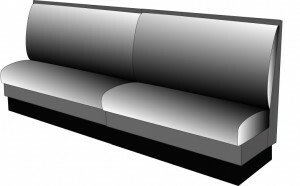 O/S BACK: Outside seat back; typically finished or not; standard fabric for finish is seat fabric unless noted otherwise. 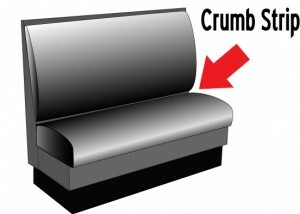 CRUMB STRIP: Optional crumb strip may be added and finished in upholstery, wood or laminate. FABRICS: Fabrics are customer choice. 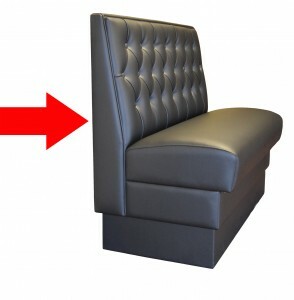 Please specify the manufacturer, type and color for both inside back and seat. If you would like us to present a few options to you at least specify a color and we’ll look a few up for you in a couple different price points. Plans would help, wouldn’t they? You can upload your corresponding files here, we’d be happy to look them over.